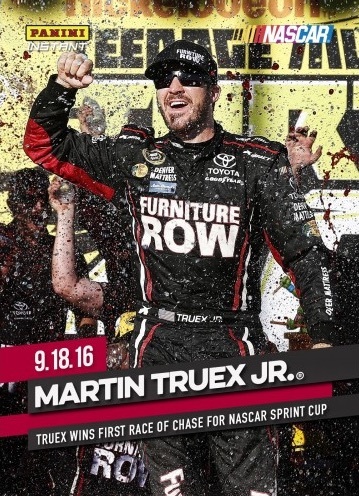 Shifting gears into the world of racing, 2016 Panini Instant NASCAR applies the on-demand card brand to their recent NASCAR license. 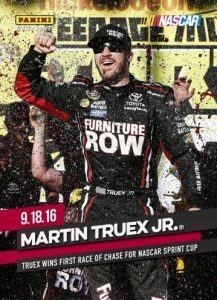 Starting with the 2016 Chase for the Sprint Cup, new cards will be issued regularly that reflect key events and milestones. Working with a basic look, the main design offers a full-bleed image and large text box with a caption documenting each moment. 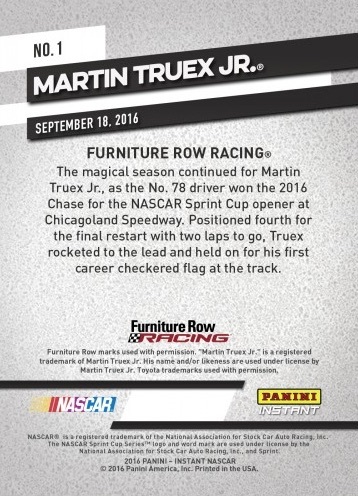 Card backs provide a more detailed summary of the events of note and subsequent cards will be numbered in succession. 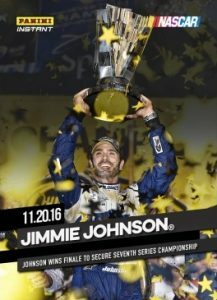 This page will be the hub for 2016 Panini Instant NASCAR Racing cards and new releases will be added as they are announced. Check back regularly for an updated look at the checklist and any other wrinkles that emerge for the set. 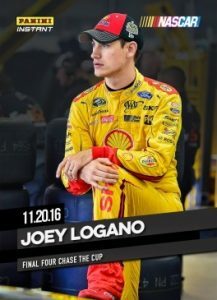 Shop for available Panini Instant NASCAR cards at the Panini store.